I absolutely adore the texture of paper that resides in old books, and there is a local book shop that likes to throw out any books that don't seem to be selling too well. Fortunately, they provide people the opportunity to purchase them before these books are tossed. 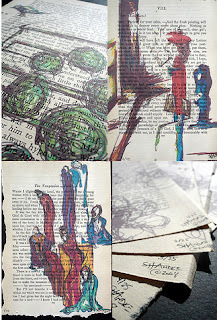 Since I've been wanting to create prints of select scribbles--sketches, I thought this would be a fun way to reuse those once loved book pages. I am recycling the paper from the books, which really helps me to feel better about my bit in conserving the environment. After all, that is the original concept for my scribbles--sketches: to use others' waste and turn it into something that others would love to have. The fun thing about these prints is that some of the pages from the books have watermarks on them, so it adds one more interesting element. 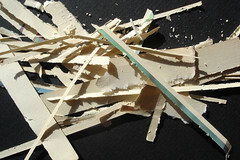 Each of these prints is made from a high-resolution 600 DPI scan, and they are printed on various pages of ephemera. They are all printed as limited editions, so if you see one you like, buy it now! All of the colors are as truthful as can be. Each piece is signed, dated, numbered, and may be mounted to acid-free cardstock if you're interested. Every print has been treated with an acid-free fixative and is ready to frame, hang, or display on your shelf.